Acting as a local sales office for our own venture companies, EVO GTM delivers European sales acceleration and rapid ROI, providing our ventures with exactly what they need to set up, break into and expand within the European market. Getting product-market fit right, the first time is hard. Building a successful sales platform and distribution strategy can be costly, resource intensive, and risky. After the platform is built, how do you know who the right partners are to launch with? How does a startup incentivize their channel partners above and beyond standard resale agreements. We can help write an EMEA tailored channel programs. Developing Channel Strategy (Distri/Partners etc). Market Penetration via a trusted network. We have over 25 years experience in recruiting, managing and driving revenues through Distribution and Resellers. We know ‘Who is Who’ in Distribution and the Reseller community. We support our ventures with Channel Partners in EMEA and Asia-Pacific region. More frequent CXO interactions provide critical feedback loop for testing and validation of product/market fit and set up future sales opportunities. Save time, capital and resources by getting the GTM strategy right the first time. Accelerate sales with faster build-out of a channel ecosystem with a track record of success. Enterprise executives are constantly looking for the best ideas and new technologies to bring into their companies. Startups are the source of innovation and growth in the economy. 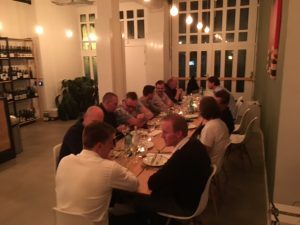 We organize 4 times a year our EVO Expert meetings that provide senior IT decision makers unparalleled access to the emerging technologies and leading companies shaping the technology landscape. The network is designed to give decision makers the power to explore emerging trends, discover the most promising startups, and build community with peers who share the same challenges and successes within a private, professional network.